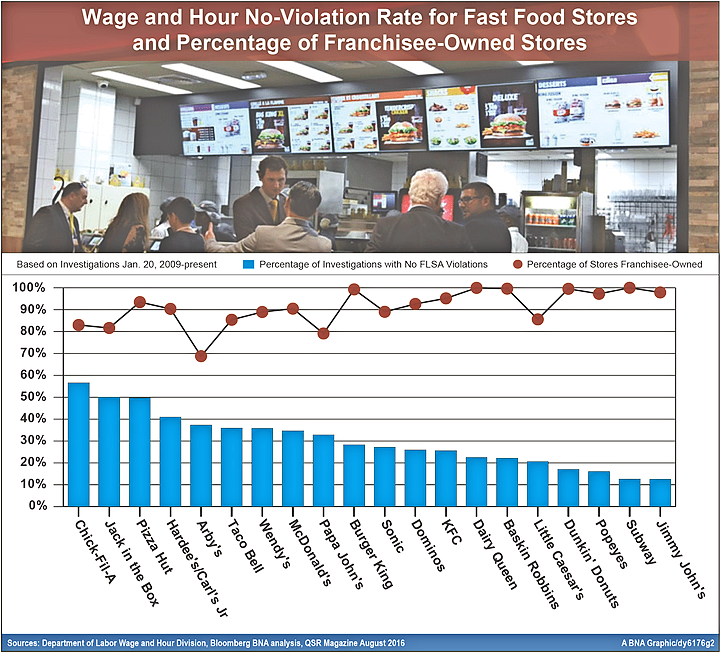 Is Franchise Model a Recipe for Fast-Food Wage Violations? Sept. 13 — The franchising structure itself contributes to fast-food restaurant violations, the official overseeing the Labor Department’s wage-and-hour enforcement strategy argues, but the theory is subject to debate. Regardless of the cause, here’s what’s certain: Fast-food workers earn low wages to begin with and when Wage and Hour Division investigators audit leading quick-service brands, they’re very likely to find Fair Labor Standards Act violations. In 2010, before David Weil became the WHD’s top official, he recommended that the agency focus fast-food investigations on franchisees, particularly on larger multi-outlet owners. Weil, then an economics professor at Boston University, said in a report to the division that franchised outlets have less incentive to comply with wage-and-hour laws than their company-owned counterparts. Two years into Weil’s regime as administrator, a Bloomberg BNA analysis of WHD investigations at the top 20 fast-food brands shows his advice appears to be informing the enforcement strategy for the quick-service industry. “The business structure that can create incentives for noncompliance in the eating and drinking industry, particularly in the branded eating and drinking industry, is the structure of franchise relationships,” Weil told Bloomberg BNA in a recent interview. Industry-specific data is driving a continued enforcement focus on industries such as fast food from an agency determined to achieve the greatest possible impact with limited resources, Weil told Bloomberg BNA. Federal investigations have been focused on Subway, McDonald's, Dunkin' Donuts and other national brands, the data analysis shows. Over the course of the Obama administration, the WHD has conducted nearly 4,000 investigations at the 20 largest fast-food brands combined, leading to discovery of more than 68,000 FLSA violations and some $14 million in back wages recovered for about 57,000 employees, a review of WHD enforcement data found. And that’s not counting liquidated damages paid to employees, a figure not tracked on the division’s public enforcement database. Three-quarters of investigations at the top 20 companies uncovered at least one FLSA violation. There’s no single explanation for these results, as a variety of factors contribute to complaint-driven and WHD-initiated investigations in fast food or any sector. The restaurant industry response is that franchisees are small independent business owners who most likely can’t afford a labor attorney. Among the 20 largest fast-food brands, WHD investigations at the Jimmy John’s sandwich chain were the most likely to yield at least one FLSA violation. The Jimmy John’s no-violation rate was 12.6 percent (see graphic). The WHD administrator believes it’s a deeper-rooted dilemma than purely a lack of resources. Weil’s research, included in both the 2010 report and his 2014 book, “The Fissured Workplace,” attempted to calculate franchising’s effect on FLSA compliance at the top 20 fast-food companies. Based on 2001-2005 enforcement results, the average franchisee owed $4,265 more in back wages per investigation than a similar outlet that was franchiser-owned, Weil said. He declined to discuss exactly how these findings have framed WHD’s strategy now that he’s in charge of the division. Still, if the current ownership pattern at the top 20 quick-service brands (93 percent franchised versus 7 percent company-owned) is any indication, any WHD fast-food investigation is extremely likely to target a franchisee. Worker advocates say there’s a persistent problem of fast-food managers feeling pressured to cut labor costs, and that the franchise business structure plays a role. Stores run by owners of multiple outlets might be especially prone to cheating workers, Michael Hancock, of counsel at plaintiffs’ firm Cohen Milstein Sellers & Toll PLLC in Washington, told Bloomberg BNA. Fast-food franchisees pay franchisers royalty fees as a percentage of revenue, ranging from about 4 percent to 12 percent, depending on brand. Even though standard franchise contracts contain a clause that the franchisee will follow all applicable federal and state laws, the royalty arrangement forces franchisees to balance brand protection against the need to earn profits and limit costs, Weil said. The industry’s prevalence of wage violations has been publicized in recent years by the national fast-food worker organizing campaign, Fight for $15, which is backed by the Service Employees International Union. “Wage theft is a rampant, everyday problem in the fast-food industry: Nearly nine out of 10 fast-food workers across the country report having money stolen from their paychecks by their boss,” Kendall Fells, the Fight for $15 national organizing director, told Bloomberg BNA via e-mail. Fells referred to a 2014 poll commissioned by the campaign of more than 1,000 fast-food workers nationwide. The survey documented such common worker complaints as being forced to perform tasks before clocking in or after clocking out, having the cost of uniforms deducted from their paychecks, and not receiving breaks during long shifts. Fight for $15 has organized multiple single-day fast-food worker walkouts throughout the country to demand a $15-an-hour minimum wage and the right to unionize without company interference. Some business-side skeptics say that Weil and other agency regulators are conspiring with the SEIU to create an environment favorable to fast-food unionization. “The fact that the employer happens to be a franchisee is a secondary aspect to the underlying reasons that” the WHD is “going after the franchisee,” Michael Seid, who operates franchising consulting firm MSA Worldwide, told Bloomberg BNA. Rather, the enforcement strategy helps the SEIU playbook, which Weil supports, said Seid, whose clients have included eight of the 20 biggest fast-food franchisers. Franchising groups such as the International Franchise Association say their model is an engine for job growth, sometimes leading to management promotions for entry-level workers. “It’s not the franchise business that is creating these issues,” Angelo Amador, vice president of labor and workforce policy at the National Restaurant Association, told Bloomberg BNA. “These are independent small-business owners. Sometimes they don’t have an HR department and they are trying to navigate a complex set of rules that the government keeps changing,” Amador said. But Hancock, who helped the WHD develop a recently finalized regulation to expand workers’ access to overtime pay, said even the mom-and-pop franchise owners have an easy path to FLSA compliance. “The argument by employers that somehow there’s this morass of federal laws governing their employment practices is nonsense,” Hancock said. “Have a decent time-keeping system; make sure that people get paid $7.25 for every hour they worked; if they go over 40, give them another half-time. That’s not that complicated,” he said. Employers don’t need an attorney or an accountant to teach them how to do that, Hancock said. Restaurant industry representatives aren’t alone in their disagreement with Weil’s ideas on franchising. Francine Lafontaine, a senior associate dean at the University of Michigan’s Ross School of Business and franchising researcher, told Bloomberg BNA that the franchise structure itself isn’t to blame. “The franchisee is dealing with these employees on a day-to-day basis” and is motivated to treat them well, she said. Putting aside the dispute over the franchising model’s role in the process, Weil said there’s another simple reason his investigators devote considerable time to the quick-service sector: Employees earn slightly above the minimum wage, and there are about 4 million of them nationwide. Fast-food restaurants pay nonsupervisory employees an average of about $9 per hour, according to DOL figures.